An opportunity to discuss your project goals, your wishes, timing and budget and for me to discuss our services and offerings. Together we determine if it is a good fit to move to the next stage. We meet to discuss your vision and wishes, how you want to utilize the space. I provide some initial/broad verbal recommendations and bring along my ipad to share some designs and materials that may appeal to you, review some appropriate plants and start to develop a plant palette list for future consideration. 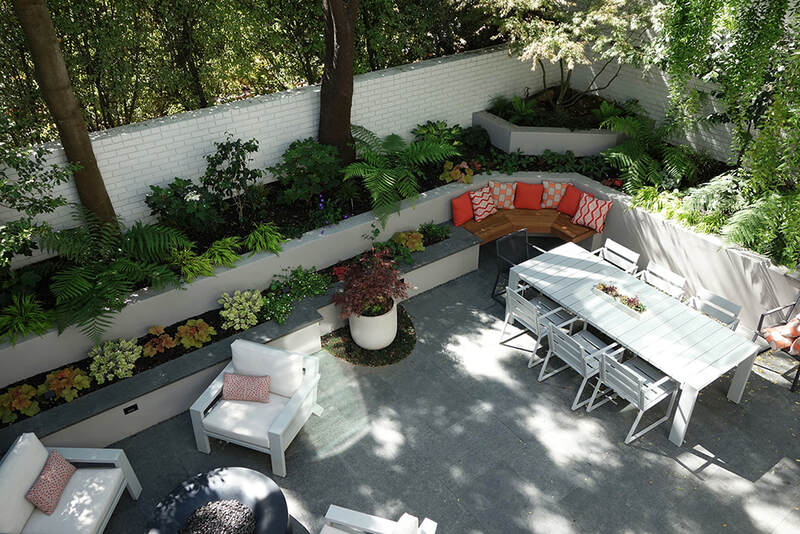 Prior to our consultation I encourage you to spend a little time reviewing photos on houzz.com or Pinterest and creating an ideabook or page with landscapes and plants that appeal to you, and ask that you share them with me prior to our consultation. A very helpful process that provides me with a glimpse into your style and results in a more productive consultation. A fee applies for this detailed, on-site consultation. After the Consultation meeting I create a detailed design fee proposal specifying my deliverables, my process and estimated Design Fee range. Phase I incorporates the Conceptual Designs, Material and Plant recommendations, Planting Plan/other drawings and associated tasks through to the final Master Plan Drawings. Once our proposal is approved by you, I ask that you complete a detailed Questionnaire. A preliminary schedule is discussed and a portion of the fees is requested to commence the design phase. We meet to review and clarify the scope of your project and your completed Questionnaire. I analyze the site conditions, such as sun and shade patterns, etc. For landscapes with varying elevations and slopes, it may be necessary to utilize an outside resource to conduct a site survey that provides us with accurate site map with measurements, placement of structures, trees, etc. and the landscape topography. Less complicated/flat landscapes with minor slopes can usually be measured by our team. Once measurements/site analysis is completed the site map serves as the foundation for our scaled base-map layout and design drawings. We develop all drawings in Vectorworks, a CAD (Computer Aided Design) software program. One or more conceptual 2D design drawing approaches will be presented to communicate our visual landscape design recommendations. 3D/perspective drawing renditions can also be created if needed/desired to further convey the conceptual designs. Concept drawings will be accompanied by an “image board” to further convey the conceptual approaches, styles, plant themes and material recommendations. During our next meeting we review the designs and discuss any modifications and refinements. And we welcome a collaborative approach. Once a Concept Design Drawing is approved, we move on to the Plant Palette recommendations and the Planting Plan drawing. The Design Phase I includes irrigation zoning and if desired the design of low-voltage lighting plans. 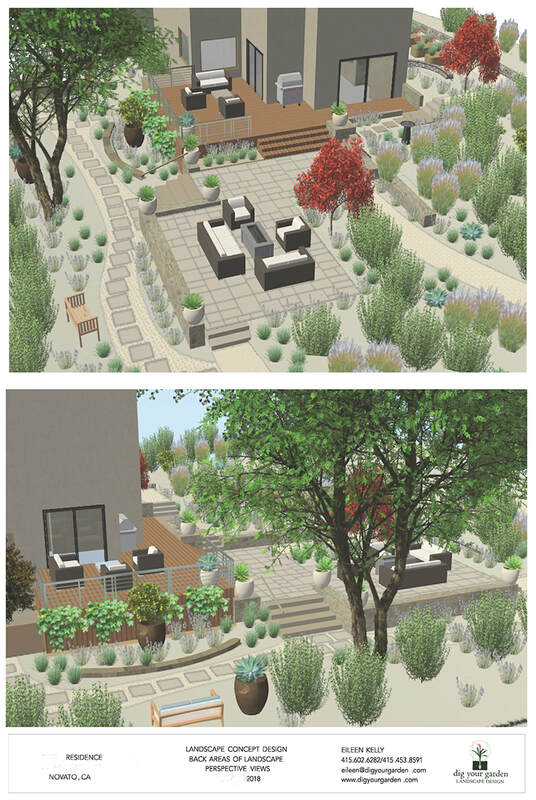 The final step in the Phase I design process is to detail as needed materials and elements that will be incorporated in the landscape. We detail these drawings as needed to obtain precise bids from Landscape Contractors, other installers and when necessary for structural engineers, permitting, etc. The details provided will vary from project to project along with the elements and details that are incorporated in the new landscape. -When you are ready to implement your project, Dig Your Garden is available to assist in the bid process by recommending landscape contractors or other installers as needed. We encourage our clients to keep us involved throughout this process as needed to address/answer any questions that inevitably arise during the construction/installation phase and also to ensure that the integrity of the design you approved is carried through to achieve the desired result. We are available to identify/recommend/secure the various elements in the final plans such as furnishings, pottery, BBQs/built in kitchen equipment, water features, etc. And we usually estimate and secure all of the plantings, followed by the direction of their placement with the installation. Dig Your Garden works with several contractors who offer excellent customer service, quality work and great references. We have developed solid working relationships and collaboration with many. See a detailed listing of the ​SERVICES we provide. 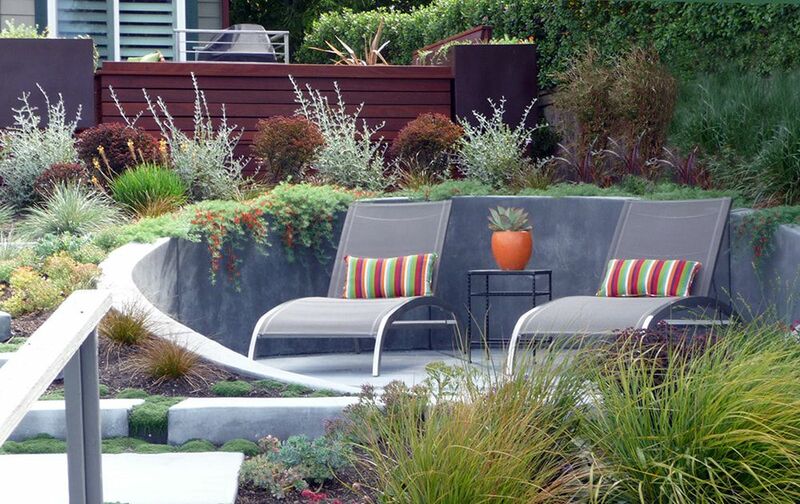 Modern San Francisco Landscape Renovation Recently Completed.